It's hard to imagine someone who served our country in the military living on the streets. Unfortunately, for many veterans, homelessness is a sad reality. Although there’s no official count, the U.S. Department of Veteran Affairs estimates that nearly 40,000 veterans are homeless. One of the biggest contributing factors to homelessness among the veteran population is post-traumatic stress disorder or PTSD. Living as a homeless veteran is hard enough. Add in the struggles of PTSD, and it takes the situation to a whole different level. PTSD can affect anyone who’s experienced a traumatic situation, even if they’re not in the military. However, because traumatic situations can be commonplace in war zones, it affects military members disproportionately. At least one avoidance symptom. Avoidance symptoms stem from the affected veteran wanting to stay away from places, events or objects that remind them of the traumatic experience, as well as avoiding thoughts or feeling related to it. So, a veteran may avoid talking about war or may steer clear of people who served in the military altogether because being around other veterans brings back bad memories. At least one re-experiencing symptom. Re-experiencing symptoms are quite like they sound—flashbacks, which include physical symptoms such as sweating or elevated heart rate, bad dreams and frightening thoughts. A veteran with PTSD may feel in immediate danger even when no actual threat is present. At least two cognitions and mood symptoms. Cognitions and mood symptoms mean that the affected person has negative feelings, both about themselves and the world around them, feelings of guilt or blame and has trouble remembering key parts of the event that caused PTSD. At least two arousal and reactivity symptoms. Arousal and reactivity symptoms, which are often constant, include startling easily, feeling tense, sleeping issues and having angry outbursts. PTSD is often accompanied by other mental illnesses. Common comorbid conditions include depression, anxiety, and substance abuse. Researchers estimate that between 11 and 20 percent of veterans who served in Operation Iraqi Freedom or Operation Enduring Freedom struggle with PTSD. Additionally, an estimated 12 percent of Gulf War veterans experience PTSD, while approximately 30 percent of Vietnam veterans have experienced PTSD in their lifetime. A study published in Administration and Policy in Mental Health and Mental Health Services Research found that two-thirds of homeless Iraq and Afghanistan veterans have PTSD, which is significantly higher than homeless veterans who served in previous wars. Many of these veterans with PTSD didn't receive adequate treatment to help them deal with the traumatic events they witnessed in the military. Consequently, they struggle to maintain jobs and have difficulty finding things in common with their friends and families. When veterans are discharged from the military, many of them struggle to fit back in with civilian life. Research shows veterans' lack of support and social isolation contributes to homelessness among veterans with PTSD. The VA estimates that approximately 11 percent of homeless people are veterans. Additionally, homeless veterans are nearly entirely male; just 9 percent of homeless veterans are female. These veterans don’t come from any one particular war zone. 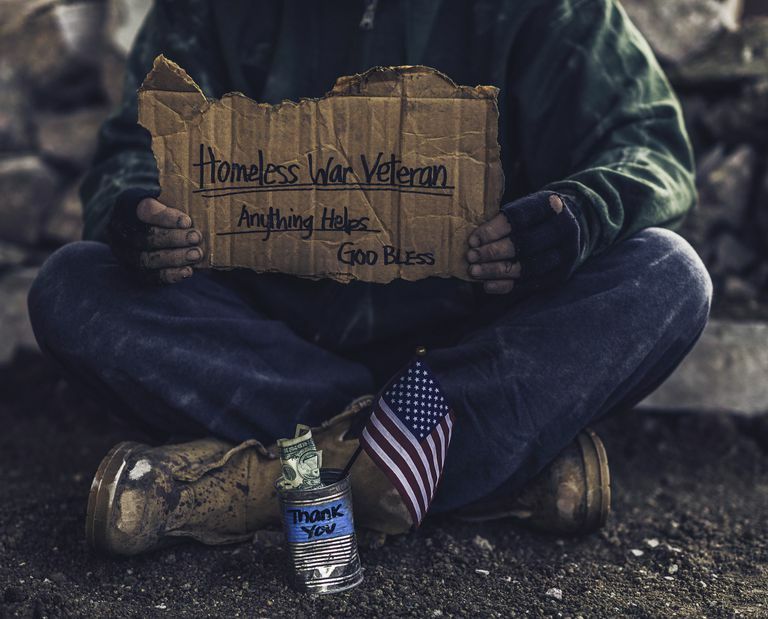 Among them, homeless veterans served in wars ranging from World War II to Vietnam to Afghanistan and Iraq, as well as in the military’s anti-drug efforts in South America, says the National Coalition for Homeless Veterans (NCHV). Many people assume the VA and other federal government departments are taking care of veterans when they leave the military. The VA does have a specialized homelessness program for veterans that provides health care to nearly 150,000 while more than 40,000 homeless veterans receive some sort of monthly compensation or pension, notes the NCHV. Additionally, the department has secured more than 45,000 beds for homeless veterans across the United States. For example, a joint program between the VA and the Department of Housing and Urban Development has awarded more than 85,000 Section 8 Housing Choice Vouchers to Public Housing Authorities across the country since 2008. In 2012, the VA introduced the Supportive Services for Veteran Families (SSVF) with the goal of both preventing homeless veterans and finding housing for those who do experience homelessness. In 2015, this service helped more than 157,000 people, including 99,000 veterans and 34,000 children, with just 9.4 percent returning to homelessness after benefits expired. However, when a veteran also experiences PTSD and other issues, whether it’s substance abuse or additional mental illnesses, they don’t always seek out the aid they need—nor is there enough aid to meet demand. That’s why there are community-based organizations that aim to meet the needs of homeless veterans—more than 2,100 of them across the country. The groups do what they can to work in collaboration with governmental agencies, veteran service organizations, and other homeless aid groups. NCHV notes that the most effective programs are those that allow for transitional housing for the veteran that’s both structured and substance-free—the ideal solution for all veterans struggling to return to a normal life. If you know of a homeless veteran, you can contact your local VA Medical Center. Trained staff can offer information about resources available in your community and the steps you might take to help someone. While you can't force someone to get help (as long as the person is competent), sharing resources or alerting a professional to the situation may be a step in the right direction. Notifying staff at your VA center of the situation is important. Some centers provide outreach workers who can meet with homeless veterans on the streets to provide them with urgent medical care or to inform them of housing assistance or treatment options for mental health or substance abuse issues. More PTSD Among Homeless Vets. American Psychological Association. Published March 2013. FAQ About Homeless Veterans. National Coalition for Homeless Veterans. Hamilton AB, Poza I, Washington DL. “Homelessness and Trauma Go Hand-in-Hand”: Pathways to Homelessness among Women Veterans. Womens Health Issues. 2011;21(4). Homeless Veterans. We Honor Veterans. Post-Traumatic Stress Disorder. National Institute of Mental Health.